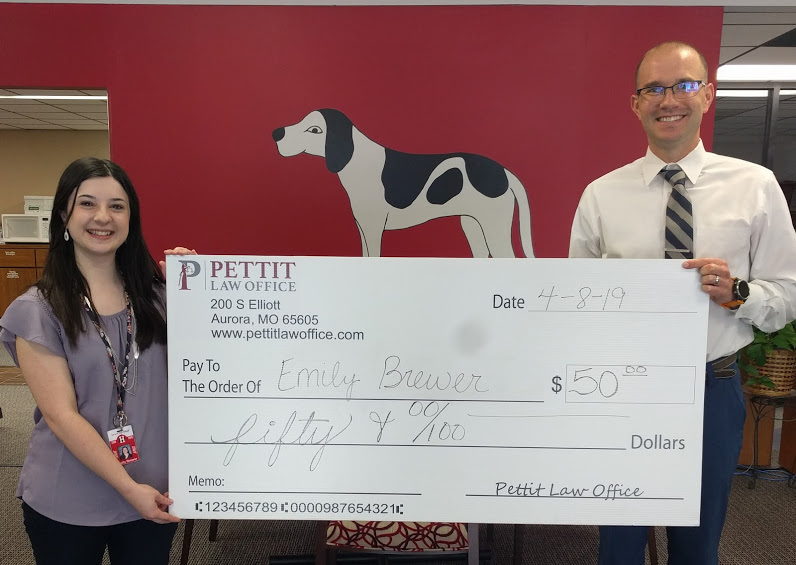 March Teacher Winner: Emily Brewer (Junior High/High School)-$50 from Pettit Law Office. Congratulations Emily and thanks to the sponsors of the program-Pettit Law. Aurora Families, The bus routes are running 10-15 minutes late this afternoon. Thank you for your patience as we work to get students home safely. Please call central office if you have any questions. No school on Friday, April 19 due to Spring Break. Monday, April 22, was initially scheduled as a day off; however, school will be in session due to a snow make-up day. Again, School will not be in session on Friday, April 19 and will be in session on Monday, April 22. No School Friday, March 22 or Monday, March 25 for Aurora R-VIII Students. School will resume Tuesday, March 26. Aurora 'Summer School Rocks 2019' enrollment forms are out! Don't miss your chance to rock the summer in style and earn prizes for perfect attendance. Call your child's office to learn more today! February Teacher Winner: Kim Juracek (Robinson Elementary)-$50 from Pettit Law Office. Congratulations Kim and thanks to the sponsors of the program-Pettit Law.